The global automotive head-up display systems market is estimated to value US$ 491.6 Mn in 2016 and is projected to register a CAGR of over 24% in terms of value during the forecast period 2017–2026. Automotive head-up display (HUD) system is an electronic system that projects information either onto the windshield of a vehicle or a small transparent screen called a combiner. These systems were initially developed for the aviation sector, but have made their way into various other sectors, including the automotive sector, besides others. 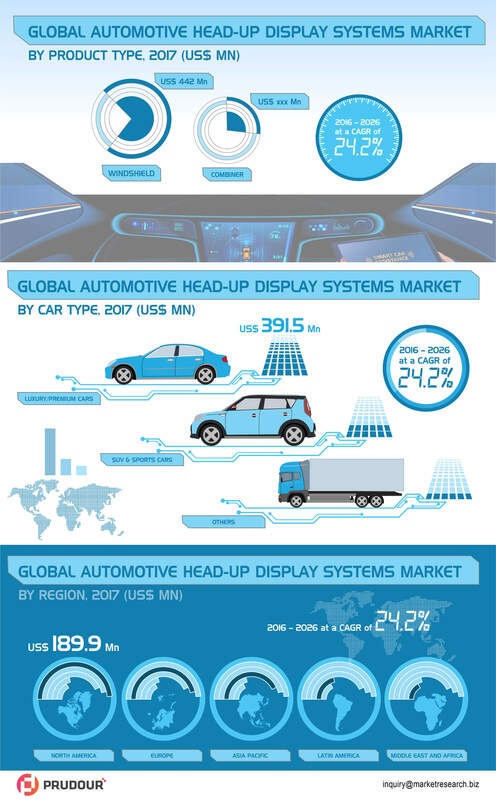 Some major players operating in the global automotive head-up display systems market include Nippon Seiki Co., Ltd., Continental AG, DENSO CORPORATION, Delphi Automotive LLP., LG Display Co., Ltd., Panasonic Corporation, MicroVision, Inc., Yazaki Corporation, Visteon Corporation, and Kyocera International, Inc. – Display Division.